Last night, the Penguins defeated the Red Wings at Consol Energy Center by a final score of 6-3. It was a great game for the Penguins’ offense, and more importantly, their young guns came through. Scott Wilson scored his first NHL goal, celebrating by immediately skating to Conor Sheary, who set him up with a beautiful pass in the slot, which Wilson fired 5-hole on Mrazek, giving the Penguins, at the time, a 4-2 lead. Kind of reminds me of the Mighty Ducks movies…and in that regard, these guys are finally “Ducks,” and absolutely deserve to be wearing that sweater. That being said, the Penguins have some bottom 6 guys injured, such as Fehr, Bonino, and Bennett that will be pretty much guaranteed a spot back in the lineup when they return. So unfortunately, some of these guys will be demoted, but that does not take away from their impact on this team. They bring energy, passion, speed…exactly what the Penguins need. We’ll have to see how Rutherford handles that situation when the time comes. Anyways, back to last night’s game. The Penguins announced their lines before the game on their official twitter account, and nothing seemed different than the previous couple of games in regards to lines. Then, Crosby’s line started the game, but he had a new right winger, whose name is Phil Kessel. Sullivan, minutes before the game, broke news to Kessel that he was going to swap him with Hornqvist in the line combos, giving Phil his first legitimate chance with Sid on a line since October 22nd. The good news: it worked. For both guys may I add. Ben Lovejoy, surprisingly enough, got the Penguins on the board early. The Hornqvist-Cullen-Hagelin line was out on the ice, and Cullen carried the puck into the zone. He took a shot, but it was blocked by a Detroit skater. The puck bounced over towards the boards to the right of Mrazek, and Hornqvist beat 3 Detroit Red Wings to the puck, eluded 1 guy, and ripped a pass over to Lovejoy at the right point. Lovejoy corralled the puck and put a quick wrist shot on goal that deflected off of the stick of Helm and went 5-hole on Mrazek. Detroit would answer and tie the game at 1. Athanasiou came flying into the zone right down the slot, and then dished the puck off to the right to Nyquist. Athanasiou’s speed drew the Penguins toward him in the slot, and then Nyquist made a brilliant pass to Jurco who was flying down the slot wide open, and fired one past Fleury. Later in the period, the Penguins were in the offensive zone battling behind the net for the puck. Hornqvist would win the battle and get the puck up to Trevor Daley, who some have criticized in recent games for not shooting as much as he should. Well, this time he did. Hornqvist deflected the shot which was stoped by Mrazek, but Cullen buried the rebound to give the Penguins a 2-1 lead that they carried into the intermission. Early in the 2nd, the Red Wings once again tied the game at 2. Quincy carried the puck into the zone and dropped it off to Glendening at the blue line. He fired a shot on net that was blocked, but the first man on the puck was Red Wings young superstar rookie Dylan Larkin who made a quick backhand move on Fleury to score. Just 24 seconds later, Phil Kessel gave the Penguins the lead right back. Crosby was being hounded by 4 Detroit defenders, including one of the best defensive forwards in that of Datsyuk, but Crosby was able to shed them all off and give a pass to Kessel who was flying into the zone on the right side. He ripped his shot far side on Mrazek to give the Penguins a 3-2 lead…he wasn’t done. Then it was Scott Wilson scoring his first NHL goal to give the Penguins a 4-2 lead. Although Wilson scored the goal, I give about 90% of the credit of that goal to Conor Sheary. I mean this, he looked Crosby-esque on this shift. He turned a 2 on 3 into a 2 on 1, then battled for the puck behind the net against 3 Red Wings, then somehow got control, and whipped a pass out to Wilson. Easily the best shift I’ve seen Sheary play. The Penguins would take that 4-2 lead into the 2nd intermission. 6:26 into the 3rd, Kessel would strike once again. Kunitz passed the puck to Maatta at the point who put a quick shot in on Mrazek. Kunitz deflected the shot, and Kessel pounced on the rebound. The puck was on edge, and Kessel did not get all of his first shot, but he continued fighting and found his own rebound and buried it, giving the Penguins a 5-2 lead. Mrazek was pulled as a result of the goal. Zetterberg closed the gap a little bit late in the third. He received a pass cross ice from Abdelkader and made a backhand deke right in front of Fleury and roofed it. It was a pretty goal I admit, but the good news is that it only made the game 5-3. Crosby would add an empty net goal to cap off the victory, and the Penguins would win 6-3, scoring 6 goals without superstar center Evgeni Malkin. Now try and tell me that’s not impressive?! Hornqvist had 2 assists and Kessel had 2 goals as a result of the new line change. 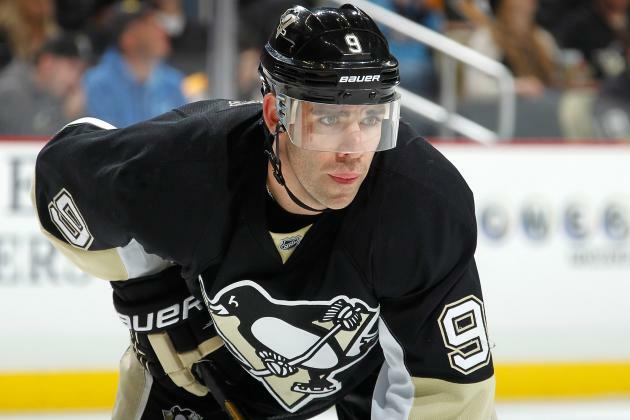 Until Geno comes back, expect Kessel to be with Sid and Hornqvist to be with Cullen. Even when Geno comes back, there is a good chance Kessel stays with Sid if Kessel gets going in these next few games. The Penguins are now 8-3-1 in their last 12 games under Mike Sullivan. 7 of those games are without Malkin, and almost all of them are without Fehr, Bonino, and Bennett. Column on Sully late tonight/early tomorrow. This marks the 3rd time in 8 games that the Penguins have scored 6 goals, which is a season high. Fleury may have allowed 3 goals but I actually felt that he played excellent. He made a couple of huge saves, and the goals he did allow were simply beautiful plays by Detroit that Fleury could not do much about. The Penguins play back-to-back afternoon games at 12:30 against the Lightning at home on Saturday and then against Buffalo on the road on Sunday. I would expect Fleury to start on Saturday against TBL and Zatkoff on Sunday, given that Zatkoff was in net against Buffalo earlier this season when he stopped 50 of 53 shots. Just over a week ago, the Penguins played the Florida Panthers in Florida, just like they did tonight. The Panthers scored a goal towards the middle of the 3rd period, and a shorthanded one at that, to put them ahead 2-0. All hope seemed lost. Then, with 5 minutes left, the Penguins began their comeback magic. They scored 2 goals, tying up the game, and then winning it in overtime on a goal by Kris Letang, his second of the game. This game tonight played out in a similar fashion. Florida jumped out relatively early in the first period on what I believed to be somewhat of a lucky goal. Alex Petrovic fed the puck through the slot, and I swear it went by almost every Penguins player, and at first, I was mad they weren’t playing good defense. However, it ends up that the puck deflected off of a Penguins stick, which then caused the puck to hop over Kessel’s, but the puck still landed perfectly on Bjugstad’s stick and he made it 1-0. Florida, in general, dominated the first period. Fleury kept them in it, but the Penguins needed to pick things up. The Penguins found a spark that gave them a chance in Florida once again. This time, it came off of the stick of Chris Kunitz. Crosby tied his man up on the faceoff to Montoya’s left, and Kunitz came in and dug the puck out. He skated to the slot and absolutely rifled a shot off of the crossbar and in past Montoya to tie the game with 3:19 remaining. The game would go to overtime, where I believe the Penguins outplayed the Panthers but were unable to score. Bryan Rust had 2 glorious chances that would not go, Letang had a great chance…but the greatest chance of all came off of the stick of Phil Kessel. Crosby skated the puck into the zone and the entire Florida team flocked to him, only for him to find Kessel streaking down the middle of the ice. The guy has a dangerous shot, and he was as wide open as wide open can get in the 3 on 3 overtime, but Montoya denied him. Also, honorable mention to Crosby who somehow disrupted a Florida 3 on 1 chance. It was a tremendous defensive play and at the moment, gave the Penguins a chance to get an extra point. Huberdeau was first for the Panthers. The left-hander skated from right to left and tried to fool Fleury with a wrist shot and wait Fleury out. Well, he did fool Flower, but the post gave Fleury some love. Crosby then shot for the Penguins and scored on Montoya. Crosby loves to go high glove or 5-hole (between the goalies legs). Tonight, he went 5-hole and put the Penguins up 1-0 in the shootout. Next shooter for the Panthers was USC guy Vincent Trocheck. Trocheck tried to open up the 5-hole of Fleury, but Fleury made sure that he closed the door. The Penguins now had a chance to win it. Onto the ice came Chris Kunitz. He made a great move, as the left-hander skated right ro left, faked the shot, and went backhand. Unfortunately for Kunitz, Montoya made a fantastic glove save. However, the Penguins had yet ANOTHER chance to win, and Fleury just needed to stop Bjugstad, but could not. Fleury went with the poke-check, but Bjugstad’s long reach allowed him to go to the backhand and avoid Fleury’s poke-check to keep the shootout going. Despite Fleury not being able to make the save, the Penguins once again had to chance to win the shootout on the stick of Letang, who had just won them a shootout on Friday night. Letang tried to make a similar backhand move, but Montoya was ready for it and didn’t buy what Letang was selling. Reilly Smith then shot for the Panthers, but he was quickly poke-checked by Fleury, as he came to a dead stop right in front of the net. Kessel then had a chance to end it for the Penguins. He came in flying and just took a straight up wrist shot. My goodness was it a rifle, but it pinged right off of the crossbar and back out. Montoya had no chance of stopping the shot, it was just a fraction of an inch too high. Florida then had its chance to go on top, and who else but former Penguin Jussi Jokinen. He did the same move as Huberdaeu essentially, but he did not hit a post. He found the back of the net. I know he has not been producing, but I am really high on Bryan Rust right now. The guy has some serious speed and has been creating chances for himself. I think he will benefit once some of the veterans come back, and I do not think he will leave the lineup. Flower had a strong performance. The team has struggled to score goals in its past 3 games, but it should be noted they have gotten 0 production from their bottom 6 AHL guys and they are without Geno. Hopefully he is ready to go on Thursday against Detroit. I have heard he is progressing, so we will see what his status is come Thursday. Well hey, you win some you lose some, but the fact that the Penguins could get a point out of this game where they were down for the majority of it is still a huge confidence booster, even though they had the potential to get 2. Don’t be concerned about this game or even the Penguins 3 game funk with goal scoring. When 39-year-old journeyman Matt Cullen is centering your 2nd line of Hagelin and Kessel, your team is not going to score many goals. That is not, however, a knock on Cullen. He is a good hockey player, but he is a fourth line center and PK guy. He shouldn’t be centering 2 speedy snipers. Malkin will be back soon, the bottom 6 will no longer be all AHL guys soon enough (although I do like Sheary and Rust), and the team will improve. There is no doubt about that. The fact that the Penguins got a point out of tonight…I’m happy with that. I really do want to try my best to keep up with the recap articles, so I will do my best to post one after the Thursday game against Detroit. Let’s hope they get Geno back for that one. Until next time…Let’s Go Pens.